Urodynamics (UDS) consist of a number of studies, which individually or collectively provide information about the function of the lower urinary tract. It is critical to understand how UDS can be practically used in the evaluation of patients with specific symptoms or conditions. Furthermore it is important to understand terminology, methods, and means of interpretation of the varied tests that comprise these studies. 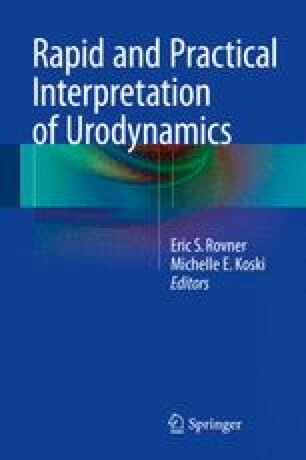 This chapter provides a brief overview of urodynamic studies including post void residual, uroflowmetry, pelvic floor electromyography, cystometry pressure-flow UDS, urethral pressure profilometry, and videourodynamics. We then dive into the indications for various aspects of the UDS studies focusing on how these tests are used in aspects of urinary incontinence, neurogenic lower urinary tract dysfunction, lower urinary tract symptoms, and other urologic conditions.